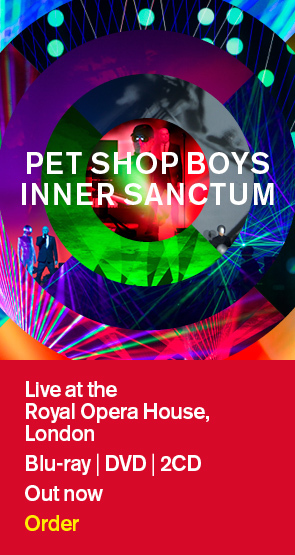 Pet Shop Boys played at Heaven in London at midnight last night as part of the "Can you bear it?" benefit night for the family of Dainton Connell, Pet Shop Boys' friend and former assistant who was tragically killed in a car accident last year. They were joined on stage by Dawne Adams (percussion) and Bic Hayes and Mark Refoy (guitars). The set list was: Go West Rent (electro version) Integral (Perfect Immaculate version) Suburbia West End girls (long version) It's a sin My girl (with Suggs and Carl from Madness) Being boring Suggs and Carl from Madness (who first got to know Dainton when he was only 12 years old) came on stage for a chaotic performance of the Madness classic, "My girl", in a new arrangement by Pet Shop Boys. "Being boring" was accompanied by a montage of film clips of Dainton. Afterwards, Dainton's wife, Mandy, made a speech thanking the organisers of the event and the line-up of DJs and the Pet Shop Boys, particularly thanking Chris Lowe "for being with Dainton when he needed you most". At 2.15 am Chris played a short DJ set, mainly composed of old rave classics, assisted by DJ Tom Stephan. During the course of the night, Pet Shop Boys' programmer, Pete Gleadall (a.k.a. Pedro Gonzalez) and Pet Shop Boys' manager, Dave Dorrell, also played DJ sets, alongside DJ legends like Judge Jules, Danny Rampling and Terry Farley. Neil Tennant and Chris Lowe would like to thank all their crew for generously giving their time and effort during the last few days. They'd also like to thank everyone who bought tickets for the sell-out event and to congratulate the organisers for creating such a memorable and successful night. EXCLUSIVE: Go to the "Exclusive tracks" folder of our Product section to hear Pet Shop Boys' demo of "My girl".